The Anolon Advanced+ 36m Open Wok is a sophisticated and professional option for the discerning home chef looking for superior quality and performance, backed by a lifetime warranty. 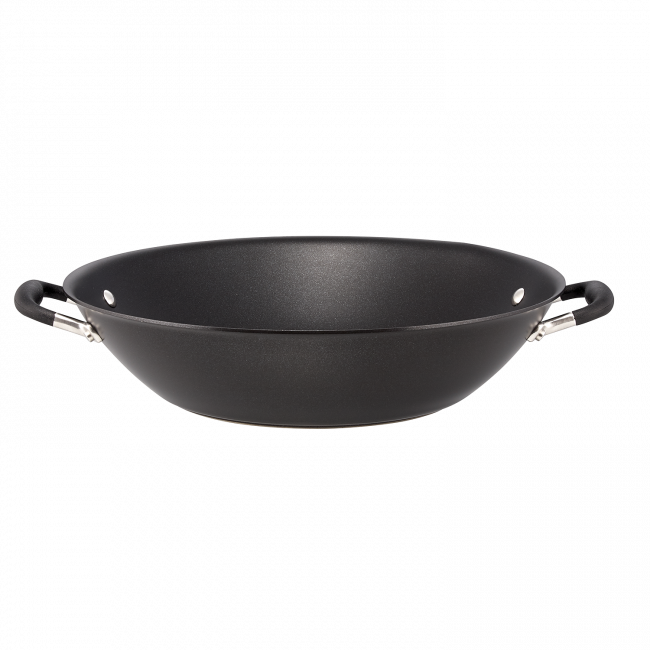 With a superior three- layer non- stick, wide 36cm diameter, and Anolon's signature Suregrip™ handles for a secure grip when tossing and flipping your Stirfry, this pan features all the characteristics of the perfect Wok, making it a favourite with gourmands. Anolon Advanced+ 36cm Wok is rated 4.9 out of 5 by 8. Rated 5 out of 5 by Beano from Dream Wok I purchased this wok and have used it many times since . It is a major step up for me and an absolute pleasure to use and clean up after use. Handles are cool touch when in use and less oil is needed as the non stick surface is excellent quality. Very happy . Rated 5 out of 5 by Lxxs from Great wok. Easy to clean. Cooks well. Great wok. Easy to clean. Cooks well. Very happy with this product. Rated 5 out of 5 by Chestee15 from Great Wok I was looking for a good wok and found this wok online. I am extremely happy with it and it has stayed in good condition. Rated 5 out of 5 by Ros 61 from Lightweight and not too deep I actually bought 2 of these one as a Christmas present and when I saw how good it looked I bought one for myself since then I have used it for stir frying, and deep frying it is so easy to clean and I love it. Rated 4 out of 5 by SCOZZIE from Wok 36cm Bought Wok for Christmas present nice size feels good to handle not to heavy.